The above often-used terms are repeatedly made in glossy advertisements by most pond filtration manufacturers the world over as their main selling point. These statements, often backed-up with money-back guarantees, tempt many thousands of Koi and pond enthusiasts to buy their products/designs purely as a result of these terms. And why not, if we wish to be able to see our collection of fish in fine detail at all times? Isn’t this the ultimate achievement and thus ‘proof of performance’ of any filter box? Surely there cannot be any higher aspect to strive for in any pond filtration system? There are only two main factors that really stand in the way of crystal-clear water. One is brought about by a sudden and perfectly natural ‘algae bloom’ that soon produces ‘green water’ in various shades. These range from lime green through to British Racing Green and vary on a daily basis. In rare cases I have personally witnessed, this algae bloom can also be a very striking crimson or purple in colour – almost luminous. Both of these can appear in apparent densities ranging from ‘watery’ to ‘slice with a knife’ concentrations. Neither of these periodic visitors are harmful to fish stocks as such, but their presence can reduce dissolved oxygen content in the pond – especially in warmer water temperatures. This can obviously have a serious secondary effect on the fish unless more aeration is given to raise dissolved oxygen content back to normal levels over 6.0ppm. The pond keeper can easily remove these algae forms and prevent them from striking in the first place with the help of ultra-violet clarifiers or ultra-violet sterilisers. These forms of algae are a world apart from the other types such as ‘blanket weed’, which is only really active in systems that produce very clear water conditions. Ultra-violet treatment has no effect on this type of algae and other forms of eradication have to be employed. The other factor that prevents crystal-clear water from being achieved is that of visible debris ranging from very large particles right down to the ones termed by many pond keepers as ‘fines’ which are absolutely minute. If both of these are allowed to build up continually in a pond over a long period of time, the resulting ‘water clarity aspect’ can vary from ‘mildly cloudy’ and right down to ‘black’. To remove all of this ‘mechanical debris’ from our pond water is also quite simple. Firstly ‘trap’ or ‘collect’ them all, secondly get rid of them by flushing them away quickly as one would flush a lavatory because they are of no use in a fishpond. Once this is done correctly and the pond returns to perfect clarity – one must now realise that the pond is back in operation again and this unwanted matter is returning just as long as your pump is running. In short, your lavatory is ‘Engaged’ once more. The more often you ‘flush’ your lavatory; the cleaner (visually) your pond will remain to be. There is much more detailed information regarding how to easily dispense with these two problems of green water and dirty water by using Ultra-Violet clarifiers and perfect Mechanical Filtration on other parts of this site. 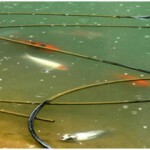 However, the purpose of this page is to discuss the subject of water ‘clarity’ desirability – specifically in relationship to Koi keeping. I am also VERY aware that there are many ‘grades’ and ‘qualities’ of ‘Koi’ offered for sale today. The lowest ‘grades’ of ‘Koi’ and the end prices they are sold for are, hardly warrants the expense of a ‘proper’ Koi pond in which to keep them. In truth, over 95% of these ‘Koi’ and other species of pet fish sold will never survive for much longer than six months after purchase. Hence the constant need for huge shipments of new stocks from all parts of the globe, every year, in order to replace those lost in the previous winter months. These losses are as a direct result of ignorance, terrible advice and the pathetic conditions provided by the majority of ‘pond keepers’. The ones who supply these endless replacements plus a further 15% for annual market growth know well the reasons for their continuing good fortunes, but they are far too busy counting their money to be concerned with such minor matters. This has gone on long before I became infatuated with Koi and will continue long after I’m gone, it’s termed in the UK as ‘The Ornamental Fish Industry’. As this website is all about Koi, I am referring to ‘KOI’ – they do not have to be champions by any means but they do refer to those with some form of breeding behind them or something worthwhile to build a good home for. Also this website is for those who are interested in providing the best possible water conditions for their pets. I must point out that this is far from ‘snobbery’ on my part but it is my own attempt to differentiate between the ‘garden pond brigade’ and the ‘Koi enthusiasts’ – because there is a VAST world of difference between the two! So I am assuming that readers of this page are Koi enthusiasts and I can now present my views and advice regarding the subject of water clarity and its desirability or otherwise when applied to keeping Koi in the very best conditions possible. 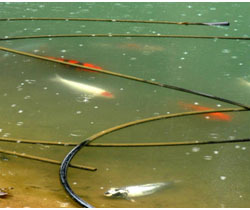 These ‘very best possible conditions’ relate to the Koi themselves and how we can provide them with true ‘Koi Water’ and maintain this on a ‘four season’ cycle, year in and year out. Because, if we can achieve this, our Koi will reward all our efforts and more by displaying incredible skin and pigmentation together with ‘ample’ but not ‘excessive’ growth and continued improvement for years to come. In my understanding of the matter, this is called ‘Koi Keeping’. If you really wish to see thousands of real ‘KOI’ in all sizes and all price bands/qualities possible and in perfect ‘bouncing condition’ – you could do worse than take a trip to Yamakoshi during October or November immediately after the harvests have taken place. The obvious ‘condition’ of these creatures is truly a sight to behold and the ‘very best’ on display are positively breathtaking and truly the ‘stuff of dreams’ for we Koi people. 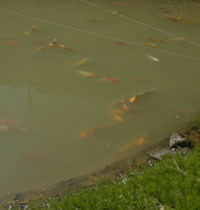 These Koi have just completed their last summer vacation (The Golden 90 Days) – in the hundreds of man-made field ponds (mud ponds – doro-ike – luxury hotels) of the surrounding mountainsides where their keepers have manually provided ample pelletised foods for them up to four times a day. To add to their luxury, the water temperatures have varied between ‘comfortable’ to ‘positively tropical’ and there’s the odd, tasty titbit for ‘snacking’. In short, this is pure heaven for a few coloured carp whose owners have considered them and some other lucky brethren to be worthy of the cost and labour involved in pampering them to the full. These are shots of some of their summer homes taken only a few days before the October harvests take place, incidentally these ponds are stocked VERY sparsely. PS. I’m in this big one below – Five Star!! They look good to me, quiet, peaceful, nice surroundings, admittedly there’s the odd shrike (tombee) or raccoon (tanuki) about looking for a fish supper but thankfully the muddy or green water allows the Koi to dive away out of view when this rare threat actually poses itself. Admittedly, the water ‘clarity aspect’ could do with some improvement if we humans wish to be able to ‘see’ the Koi within – but is crystal clear water really worth the risk in these field ponds? I assure you it’s not! Add to this ‘new-found’ crystal clear water, the powerful daily dose of the sun’s rays beating down upon the water surface. Within a few hours only, the white skins of the most precious varieties (Go-Sanke) will show the initial signs of ‘ultra-violet de-generation’ or, to the rest of us – sunburn! The skin’s previous pure white ground will now show shadows of ‘pinkiness’ – but only down to the lateral line; leave this alone for a day or so and it will become an angry purple; leave this alone for a further day and it will start to ‘peel’; after a day or so more – huge lacerations will be visible later to be further complicated by bacterial infections – leave all this alone and the Koi will die – IN AGONY! This is not unique to mud ponds by any means, I first came across this in the early ‘70’s after achieving true ‘Nirvana’ in my own garden pond by way of crystal clear water for the very first time. In my case it was made possible by the addition of a 30” diameter Lacron sand filter. Experts of the day instantly diagnosed my problem as ‘Columnaris Chondrococcus’ and thus followed a course of Gentamycin injections. To carry all this out properly, I moved the affected Koi into an indoor system and started to follow the injection advice to the letter. This expert advice produced complete, wondrous and almost instant results – I was now an experienced Koi doctor and had all the practical results to prove this. Others in the UK also were suffering with this problem and so they contacted me for advice as to how to effect the cure. Of course I passed it all on in great detail only to find that few had my same measure of success. It was not to be until some four years later that I actually found the truth of it all by visiting the Fisheries Department of Stirling University and mentioning this problem to Professor David Roberts. He smiled and took me to an aquarium that contained a few small home-bred ‘Shiro Bekko-types’. Upon instructions, his assistants placed a huge lamp assembly over the aquarium and switched it on after we first put on sunglasses that were insisted upon. The light was blinding and we left for a coffee, 15 minutes later we returned to find our white Koi were now pink down to the lateral lines but still nice and white below. It was then pointed out that the sunlight could not penetrate below the lateral line and the culprit was indeed ‘sunburn’! This also affects Fresian Cattle; white horses; white mice and any other white creature that does not seek adequate shade from the hot sunlight. Gentamycin had nothing at all to do with the ‘cure’ – it was merely the shade that produced the result. However, sunburn can very easily be avoided in crystal-clear water by providing ample shade for our Koi as can be seen used widely in enthusiasts ponds from warmer climes in other countries. Now, back to the muddy green water as seen in the Japanese field ponds. In late 1982, I met an avid Japanese Koi enthusiast who visited me at my hotel in Nagaoka to explain a product he’d invented and was already on sale in Japan. After he explained his product only briefly, he begged me to visit his home near Nagoya where I was to visit a few days later. I agreed and ended up in his garden one afternoon to see his modest pond and the few superb Koi he kept within the system. He knew everything possible about each Koi and they were in superb condition after seeing each one close up in an inspection bowl where he commented on the skin, the ‘depth’ of the mucus and the pigmentation of each. All were Go-Sanke of true quality and the water clarity was excellent. He then opened a pack of his powder invention and measured out several scoops before placing it into the empty Koi bowl. He then added two buckets of pond water and began to mix it thoroughly by hand where it soon dissolved to a thick ‘emulsion-like’ texture, muddy beige in colour. After this, he poured the contents of the bowl into his pond, in seconds the water had the similarity of that of a field pond seen above and the Koi had vanished from sight completely. He then stated that he used this whenever his pond turned clear during the summer months by repeating the dosage as and when required. 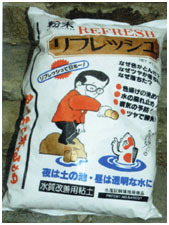 Of course the product was ‘Re-Fresh’ that I later introduced into the UK in early 1984 although it was a struggle to even begin to explain to enthusiasts that it would be wise, for the health of their Koi, to forsake their crystal-clear water in exchange for mud! I must explain here that the properties of genuine ‘Re-Fresh’ is a world apart from the pathetic imitations that then ensued and are still being offered today. Grab a couple of handfuls of clay from your garden and mix them with water, after this, tip the liquid into your pond and stand by in amazement as it turns muddy in colour instantly! Yes, the main ingredient in ‘Re-Fresh’ is ‘Montmorillionite’ – a geological name given to a particular form of clay after it was first discovered in a French town named Montmorillion many years ago. It has several useful properties, one of which was the use of it, in diluted form, as a lubricant for early forms of machinery used in industry. When mixed properly it has a ‘slippery’ or ‘slimy’ feel almost like the modern-day lubricating oils discovered much later. 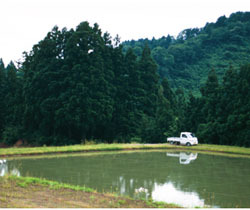 This clay is abundant in many parts of the world – notably in the mountainsides of Yamakoshi where the raw material was obtained to begin the transformation from base clay to the finished powder that became ‘Re-Fresh’. I did have the actual make-up recipe for ‘Re-Fresh’ powder many years ago and do recall that only 80% of the weight was Montmorillionite clay. Other important additives were imported from outside of Japan and some others were found in minerals sourced from other parts of Japan. 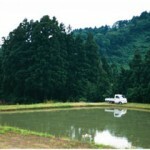 The inventor had spent a few years researching the Yamakoshi clays before finally coming up with his formula. 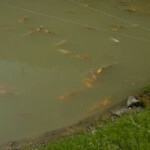 The real reason for all this was that he wished to give the benefits to his own Koi – because he was an avid Koi keeper! ‘Is there really a big enough market out there to supply mountains of pretty packets of mud with a Koi on the front’? Apparently a few seem to think so. However, whilst ‘Re-Fresh’ is most worthwhile (if you can find it today) – there is an even better option before us.